Necessity is the mother of invention. This site was born out of a necessity to share unique insights into the Fourth Way. Readership grew, and with it the need for translation into more languages. Involvement grew, and with it the need for interaction, which gave birth to our Facebook page. 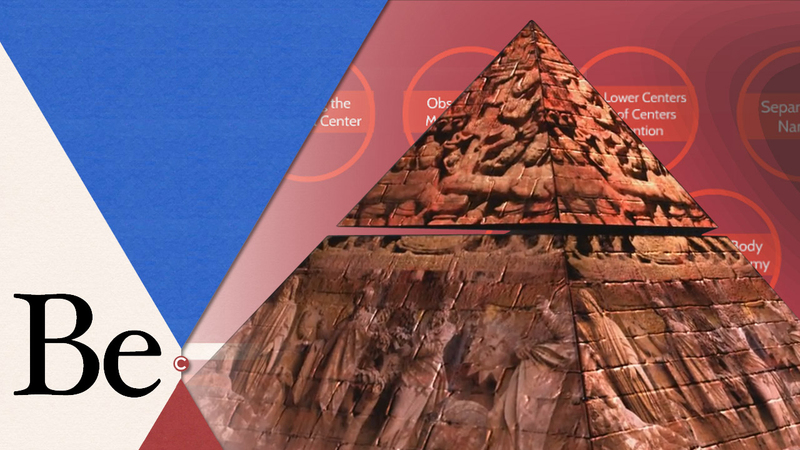 Participation grew, and with it the need for structure, which gave birth to the “Be.” Pyramid. The video above presents the construction of this pyramid. It lays out the Fourth Way principles with scale and relativity. This establishes a common language, by which those who want to become “masters of themselves”—who want to “Be”—can communicate better. To climb the pyramid, readers will need instruction. From May 30th, we will begin publishing weekly video tutorials on the “Be.” Pyramid. Each tutorial will focus on one topic, one circle in the pyramid, and set a specific exercise around that topic for the duration of the week. Questions and observations will be discussed on our Facebook page. Necessity—or “third force”, as the system calls it—is now inviting the Fourth Way into the 21st century.